"But Christine - fear can turn to love. You'll learn to see, to find the man behind the monster, this... repulsive carcass who seems a beast but secretly dreams of beauty secretly... secretly. Oh, Christine." A week has passed since I arrived into the Sakamaki's household for the first time. After my first night, I haven't really had the courage to wonder around the house anymore. Especially after sunset. The bitemarks that Kanato have left on me could still be seen as aching scars on my skin, especially the ones left on my neck. I guess mortals cannot be turned into vampires by just a single bite as I learned from old childrens books. I haven't seen Kanato since then. Hiding in my room, thinking about what happened over and over again - I still haven't found any clue about what are his feelings towards me. But I'm afraid that it has to be something close to hatret and pity - what else could it be? The vampire king looked down at you and smirked. Your cheeks were growing red, your lip was pouted out and you turned your head in the direction of some boring boxes. Marshall Lee had you pinned to the ground of your new bedroom located in HIS house. You had this coming. “I’m home” you walked into the weird shaped treehouse that you called ‘Home’, putting down a tray covered by pink creampuffs specially made by prince gumball on the table full of other snacks. Sighing heavily as you hold in the stinging pain all over your body and sat on the couch, while Fionna ran down and rushed to you. “______! Where were you!? It’s raining swords ou-“ the female hero stopped scolding you all the while cake was running here and there getting medicine, Fionna squats down to same the level of your eyes together as she took some disinfectant from cake and starts to wipe some on your scraped skin. “were you at the candy kingdom again?” she asked, you nodded without any response of words. You swung your legs back and forth rather childishly as you sat atop the counter, looking around the doll shop with a bright smile gracing your features. Your shiny (e/c) eyes met purple ones. Such beautiful eyes the man had. Pink outlined the top of his eyes while a really dark purple, nearly grey outlined the bottom. A dark blue marking was placed under his right eye. You offered him a large closed eyed smile and a small giggle. To think this man had made you think he was really going to turn you into a doll. It was quite funny now that you had looked back at it. You were so oblivious that you hadn't realized he'd been serious, even though he didn't turn you into a doll. The Male didn't even try to remove your grasp from off his shirt, he tried to avoid all possibilities of waking you up. So the teen had no other choice but to lay himself right next to you, and carefully pull the linen sheets over the both of you. He lay there with you unknowingly cuddling into him, the tuft of cloth you had in your hands had been brought up to your nose while all Rin could hear was your soft breaths while you slept being cradled by the boy in a protective manor. He had an arm slid under your neck, which you quiet happily snuggled into but Rin just slid his fingers between your soft (H/C) locks that smelt like Coconuts. His other arm was still placed around your lower back, the male pulled you slightly closer to him whenever you stirred, and his back shielded you from anything that could of brought any harm to you. "I can't wait to break you." After that day, the bear-obsessed, sugar-addict started living with me. "Hey Kana-chan..." I sigh, feeling uncomfortable in this kind of position. "What is it Usa-chan?" 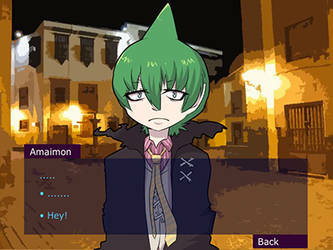 Kanato asks as he looks at me with an innocent expression. "Why do I have to wear this?!" I ask as I look down at the maid outfit with the set of matching bunny ears and tail. "Teddy thought you would look good...right Teddy?" He whines as he looks lovingly at the stuffed bear. I raise my eyebrow at the comment, "'Teddy' thought I would look good....in this?" "Yes, he's always saying the lewdest things about you. He's such a naughty bear..." Kanato whimpers as he cuddles the bear close. 'Are you sure they're not just all in your head?' I ask mentally as I look down at the black Mary Jane shoes accompanying the provocative outfit. "Though I must say...I find you very attractive as well." Mufasa the king of pride rock had recently passed, the females of our tribe took the time of no reign to kick me out of the tribe. There was no real reason, they just didn't like me because of my refusal to 'mate' with our king. So i walked the desert alone no food, no water and only rags too cover myself, with whereas in the tribe i'd have a dress with jewellery for being in the king's harem despite ever having any relations with him, due to my refusal. But Mufasa was a good man so he never forced anything on me if i didn't want to. I sighed wiping the sweat off my forehead with the back of my forearm, in any moment i could have a heat stroke, and if this was a story of some sort i probably would. ArtisticGremlin has started a donation pool!